In collaboration with SONOS Studios, the Art|Sci Center presented BRAINSTORMING: SYNESTHESIA in the SONOS Studios space in Los Angeles. The Art|Sci Center hosted a performance where artists, scientists, and musicians explore through cognitive synchronization how sound affects the human brain and body. 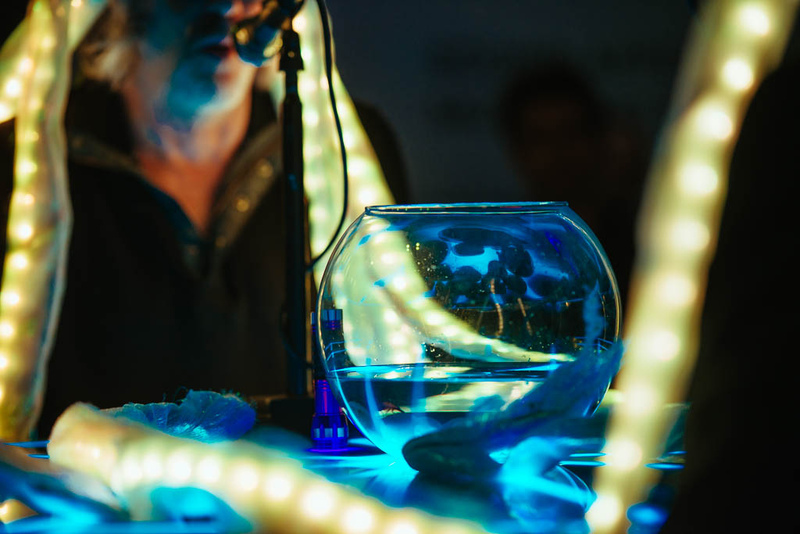 Artist and director of UCLA Art|Sci Center + Lab Victoria Vesna performed the Octopus Brainstorming session on Synesthesia with neuroscientists Mark Cohen and Don Vaughn, nanoscientist James Gimzewski, artist Mick Lorusso, and sound artists Gil Kuno, Shoshi Kanokohata and Maciej Ozog. This performance was made possible with the support of Art|Sci Team members Marissa Clifford, Mary Tsang and Ben Ward. Artist and director of UCLA Art | Sci center Victoria Vesna performs the Octopus Brainstorming session on Synesthesia with neuroscientists Mark Cohen, Don Vaughn, nanoscientist James Gimzewski, artist Mick Lorusso and sound artists Gil Kuno, Shoshi Kanokohata and Maciej Ozog. MARK COHEN -- UCLA Professor in departments of psychiatry & behavioral science, neurology, psychology, radiology and department of engineering. KUNO KANO (Japan) – The serene harmonies of traditional Japanese flute (played by Shoshi Kanokohata) are mangled by the digital glitch methodologies of distortion designer Gil Kuno. MICK LORUSSO, UCLA Art | Sci gallery – visual artist focused on energy in it’s many forms: as sustenance, movement, sensation, electricity and light. He integrates science, mysticism, ecology and community actions into his work. MACIEJ OZOG (Poland) -- critically explores the liminal territory between the body's physical activity and the invisible electric infrastructures of hybrid space. DON VAUGHN – PhD student in Professor Cohen’s lab researches freewill and group social dynamics using functional Magnetic Resonance Imaging (fMRI)b and is also a DJ and drummer.